The journey of a thousand miles begins with a single step and that step begins with a simple thought. This blog is going to give an idea about travelling at Light Speed. In the climate we have designed The Time-Machine which can travel in future only. For understanding the possible ways to travel at the light speed (c), first we need to understand “Theory of Relativity”. It was given by famous scientist “Albert Einstein”. The Relativity had been distinguished in two parts. It Talks about the relative speed of one Inertial Frame with respect to other Inertial Frame moving in a space. It states that the speed of light in any inertial frame is constant and it will never change with respect to any reference inertial frame, i.e. 299,792,458 m/s. And it also states that the Light speed is the Last Limit of Speed in entire universe. (CERN experiment’s scientists have claimed about the speed of neutrino observed beyond the light speed in October 2011. But in March 2012, they found out the mistakes in their measurements. So, Einstein’s statement, “The speed limit in space is light speed and no object having mass at rest can cross the limit” remains correct). It talks about the medium in which gravitational and electromagnetic waves flows. According to General Relativity, the entire universe is 4-Dimentional model in which of 3-Dimentions are of Space (x, y, z) and other is time (t). So, any point in universe can be shown by 4 co-ordinates i.e. (x, y, z, t). Space time is curved Geometry the curvature of space-time is directly related to the energy or momentum of whatever matter and radiation are present. The relation is specified by the Einstein field equations, a system of partial differential equations. This theory also explains the phenomena called Gravitational Lansing. In which, the star exactly beyond the sun can be seen near to Sun by Rays coming out of the Star, which is bent by Curved Geometry created by Mass of Sun. So, to achieve the speed limit of universe, we need to understand what happens at speed of light. Some basic principle will have to keep in mind. That means the Space for car driver compresses, as well as the time for car driver expands with respect to Rest Observer. This is called the Space-Time Dilation. Energy-Mass Conversion: For the same example, the mass of car-driver at rest = mo and mass of car-driver at v velocity = m.
This is a very interesting phenomena, according to which, Mass of an object increases as it moves with increasing speed (v). That means, some portion of the energy given to the car (for fuel) will convert to mass which will ultimately increase the mass of a Car-driver as well as Car. The conversion of Energy into mass is given by very famous equation. At the speed of light, the mass of a car-driver will be infinite, because at a speed light all the energy will start converting into mass and then no more energy will be used to ignite the car-engine and the car will remain to travel at nearer to a speed of light (99.999% of light speed). Or in other words, car needs an infinite energy to travel at a speed of light. Theoretically it looks possible. But in practice, it is not possible to collect infinite energy. Till now it was a problem. But there is a way to overcome and design a reliable time machine. Better Solution of this problem may be by making energy source stable. In the above example we were using fuel as a car ignition, which was also travelling with a car, which was limiting the required energy. As speed increases the mass of fuel also increases. So, we require extra energy to overcome the increased fuel mass also. If the energy source is stable (at rest) then there may be possibility to get light speed in a more efficient way. So, let’s do the thought experiment (as a hobby of Einstein). Imagine you are in a car having no engine. The car is attached with a very long iron rod, which is very strong, unbreakable and impossible to bend. The other end of the Iron Rod is connected to very powerful electric motor, which can produce a very high amount of torque and it has very high rotational speed. Electric motor is kept on rigid body. It is shown in the figure below. Now if the Electric motor starts (by giving electric supply) which is going to be kept with fixed rigid body. So the Rod which is connected to motor starts rotating. 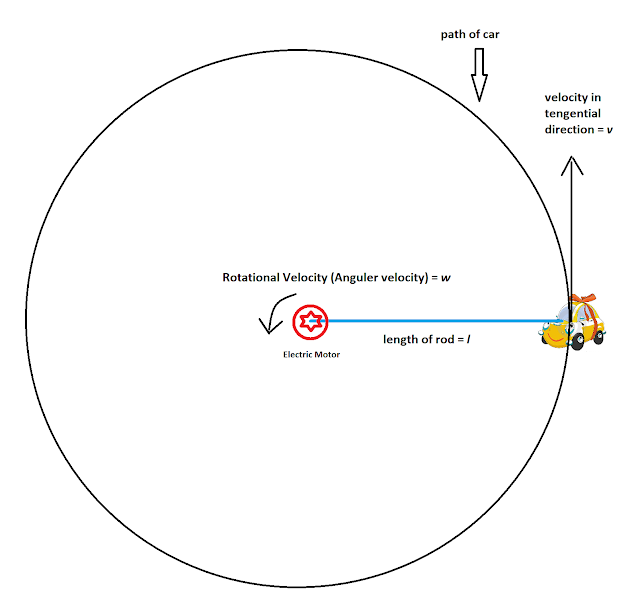 As the rod starts rotating, the car which is attached at the other end of the rod also starts moving in circular path of radius equal to the length of rod. Now, motor starts to speed up that means the rotational speed is increasing. As the Rotational speed is increasing, the car is now moving faster and faster at the other end. After some time it will achieve 99.999% of speed limit. But there are some consequences. 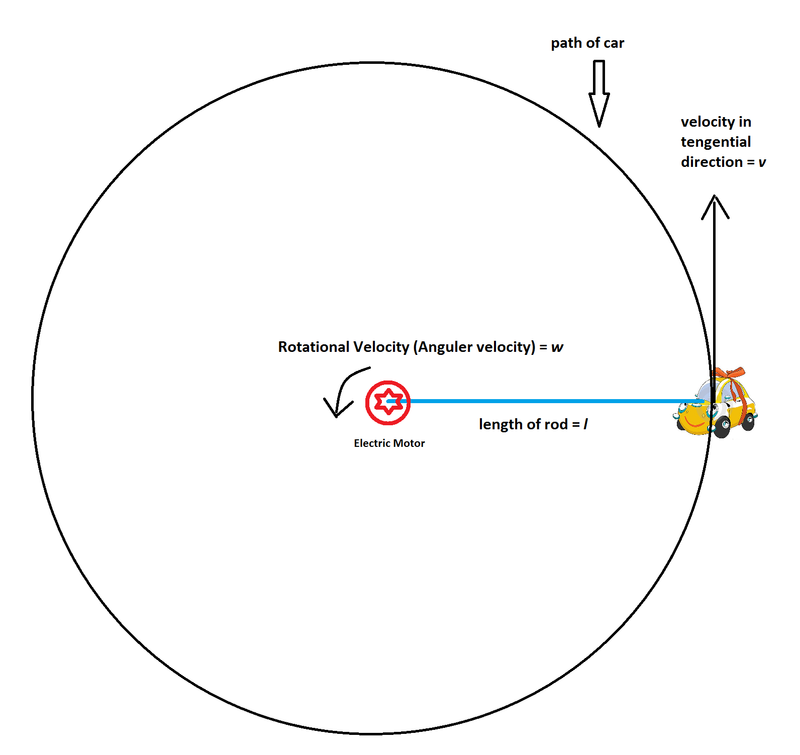 To understand this mathematically, let’s assume that the rotational speed of motor = w and the length of rod = l. So at any instance the linear velocity of car in the direction of Tangent to that circle = v.
So as w increases, v also increases. To get high value of velocity (v) at small value of angular velocity (w), it is clear that length of rod (l) should be high. That’s why we have taken length of rod as very high. D = Do * sqrt(1 – (v/c)2). So according to thought experiment, rotational motion will give a better leverage than linear motion. So let’s design the model in real world. Now it’s time to designing the model practically possible. For designing purpose, we will use possible resources. Electric motor should have higher speed as well as it should produce high amount of torque. The highest rpm ever achieved on earth is 1,000,000 rpm by ETH Zurich researchers. But for practical purpose consider medium case scenario, that this motor can produce highest torque at 600,000 rpm. for calculation simplicity round of this figure to 60,000 rad/s. Now, to achieve the speed of light at the end of rod i.e. car end, the length of rod should be l. So, length of rod = l.
We need 5 kilometer long iron rod which should have high quality of strength and its mass should be as low as possible. So that the required energy to rotate the rod will be very low and the time machine will be very efficient. Yes of course, that is very difficult to find 5km long iron rod. But for reducing a length of rod, the maximum rotational speed of motor should be increased. We have considered medium case scenario by considering rotational speed (600,000 rpm) lower than the actual speed (1 million rpm). So, if motor rotates at its maximum speed i.e. 1 million rpm, the required length of rod will be 3km. So in industry we will have to develop the techniques by which we can design this kind of Strong, very long and low mass iron rods. At the other end we can attach two chairs (or car) for time travelers. One thing which we have to keep in mind is the total mass of car and rod should be as low as possible. Finally, electric power supply to give energy to motor. So that’s it. That’s our one way to future Time Machine. So, be ready to start travelling in future. Creat Tricks is a platform to explore innovative Ideas. Any Invention is an extracted version of very tiny and crazy idea. So, This is the way, begins with a "TINY" Thought. And this is a Step towards thousand miles long journey. .............................................................. About the Blogger: I am an engineer, who want to chase limits. I like to solve real world problem using existing resources. I believe that creativity, smart working, dedication and encouragement can make anything possible. So, i started this blog for all those crazy people who want to go above the knowledge written in the book, who want to think beyond the limit of technology and who want to build his own creative world. As far as, non-technical things are concerned, I like having good time with friends. I like walking in the rain, listening to soft music, making new friends and meeting new people. I love Music. And I feel that, "Music is an Invisible Visualization". I also play drums in free time. I love travelling and exploring different culture.